We recently finished the “Teaching with the Brain in Mind” program. Wow! What an amazing event. Some came to it concerned about the challenges of brain-based learning. Others wanted brain-based strategies. Only a few were brain-skeptics. Most just wanted to deepen or widen their skill set and knowledge base. Suffice it to say, all left the program excited and ready to make changes. “This is the best professional development experience I’ve had in 27 years of teaching. I will use so much of what I learned here and I am eager to return to my students and work with them in a more enlightened approach.” Patricia Gefert, Ohio. One of the highlights was the visit to Dr. Daniel Amen’s Brain Clinic, where participants got to see inside the actual patient clinic that has been grabbing headlines for years. Amen has been “ahead of the crowd”, just as Eric Jensen has been. Another highlight was the appearance, in person, of Dr. Larry Cahill, a pioneer in memory, emotions and gender. His lab has made not one, but three breakthroughs in neuroscience. Everyone was riveted to his talk on how emotions and gender influence our memory. Everyone was spellbound! “Every single concept, activity and interaction was of great value to me.” Lois Cameron. Shaker Heights, OH. The “Teaching with the Brain in Mind” program gives you the scientific background, the strategies that can transform the classroom and once again, the actual demonstration of the strategy. This way, you can see it, hear and feel how it works. 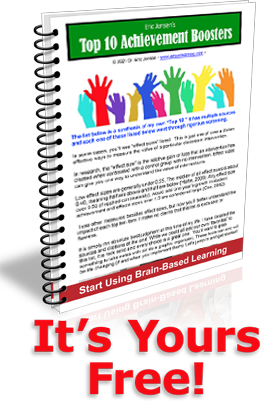 This makes it the most practical, and yet, research-based program on the brain anywhere. The next “Teaching with the Brain in Mind” program happens in San Antonio, Texas. The content will be awesome, the guest speaker is riveting and the field trip is over the top good. If you have not yet taken the “Teaching with the Brain in Mind” program, this is your only chance. Find out how to meet the challenges of brain-based learning and teaching. Meet other like-minded participants. And, most of get inspired and rocket-propelled to teach smarter, with less stress.